These are extremely challenging times for employers who need to acquire top level talent as well as for those seeking a career change. Today, companies economics compel them to re-assess their talent needs in order to remain competitive and drive growth. 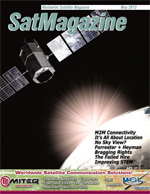 The satellite communications industry remains ripe with new opportunities. Employers are challenged with making a great hire. For the candidate, finding an opportunity can sometimes be a rather difficult proposition. To assist with career searches, we asked Bert Sadtler of Boxwood Executive Search to respond to readers questions regarding the processes of recruitment and hiring as well as how Companies can retain crucially-needed talent. Boxwood is located in the Washington, DC, region and has success in senior level recruitment in satellite communications, government contracting, and within the intelligence community. Boxwood also provides a consulting solution for the analysis and improvement of the employers current recruitment process. If you would care to submit a recruitment, hiring, or retention question for Bert to answer, please email your question to BertSadtler@BoxwoodSearch.com. One definition of the cost of a failed hire comes from a researched approach. Brad and Geoff Smart, authors of Topgrading, interviewed 52 organizations and asked them to calculate bad hires. They determined that the cost of a mis-hire for an employee making $100,000 was $1.5 million or 15X. While 15X might seem extraordinary, lets explore the definition of a failed hire, some causes of a failed hire and factors when considering the cost of a failed hire. What is the timeline that defines a Failed Hire? � Whenever there is a change of leadership, there is also a change in culture. Cultural changes can lead to change in employment. Examples include: acquisition, new manager of the employee, new Senior Executive leader, and change in corporate direction. � Once critical talent has been hired, an employer needs to implement a long-term, on-boarding program and retention plan. Competitors are aware of the recent acquisition of talent. New employees are susceptible to second guessing their decision and can be receptive to accepting a better option during the first six months of new employment. � A failed hire can occur when the expectations of the new employee and the employer dont match. Employers want results. Sometimes early results have to be measured by the completion of tasks and not solely by securing revenue. For example, securing new business in the government-contracting arena can frequently take companies one to two years. The best means to measure success is to establish a timeline with steps along the way that will eventually lead to revenue and then measure against the accomplishment of the steps. � As part of issues with expectations, failed hires can be caused by inflexible compensation plans. If a new hire is expected to deliver revenue in new market areas, time needs to be given in order to develop the opportunities. One option would be to create a short term compensation plan measured against the development of new opportunities, and then implement a long-term compensation plan based on revenue. � A failed hire can occur because the new employee did not solve the employers problem. Companies acquire talent because the talent can solve a problem. It is critical to define the problem prior to starting the recruitment and then to make sure the candidate is capable of solving the problem and has a plan before the candidate is hired. � Too few candidates resulting in the hiring of the only one-available candidate versus recruiting several highly qualified candidates. � Calling references before investing the time to get to know the candidate first. � Not spending time during the interview process to develop chemistry and then jumping right into an offer. � The cost associated with the employers reputation in the business community as a less-than-ideal place to work. � The cost associated with the loss of current and potential opportunities when new talent leaves. � The cost associated with the lost leadership momentum for direct and indirect reports when a new manager leaves. � The cost associated with having recruited the new talent and the additional cost of having to launch a recruiting replacement campaign. � The cost of negative feelings by the departed employee as a member of the workforce with a competing employer. A failed hire is the last thing that an employer or an employee wants to occur. The employer and employee share the responsibility of avoiding this. Employers should clearly define the problem they need a new employee to solve, and work toward hiring and retaining someone who can accomplish this. The employee has the responsibility of understanding what the problem is and delivering an agreed to solution. I hope you have found this to be helpful.